André Greipel has won the final stage of the Volta ao Algarve. It’s the fifth victory of Lotto Soudal this year. For Greipel it’s the first win of the season. In a bunch sprint the German champion beat Tom Van Asbroeck and Rüdiger Selig. The stage to Vilamoura was flat with only one climb of third category. The situation changed a few times. First there was a front group of three riders, then it were five and finally seven escapees. The front group was caught in the final kilometers, thanks to the chasing of among others Lotto Soudal. The train of Greipel rode to the front and the German could finish it off perfectly. The overall victory of the Volta ao Algarve is for Geraint Thomas. 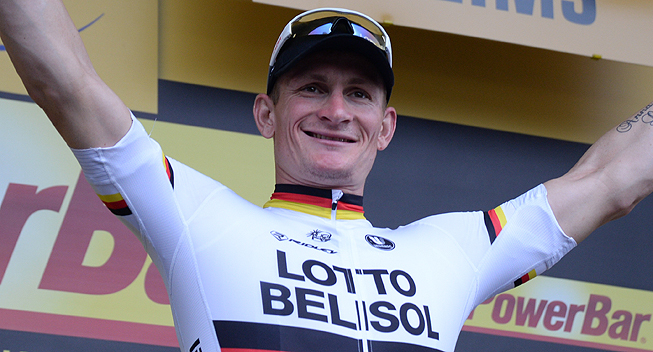 “It’s always a nice feeling to get that first win of the season," Greipel said. "The team set up the sprint perfectly for me. They did a great job all day long. A lot of Portuguese teams tried to get in the breakaway. The situation changed a few times, at the end seven riders were in front. We were worried that if they would all work together, they could stay ahead until the finish. Sean De Bie and Stig Broeckx controlled the breakaway. We knew the finish area, which really suited us. We had a plan and it worked out well.